Welcome to December's edition of Spa Voice, the UK Spa Association‘s monthly newsletter. As 2017 moves into the last month, we are mindful of how busy December can be, with clients who request last minute appointments, gifts for Christmas, and making sure we make December go out with a boom. Planning in December to sustain new business in 2018, we look at PR & marketing and how we can promote the first quarter of the year, with a New Year campaign. Being conscious of your own physical wellness we look at facilities able to assist with any imbalances we may be experiencing. 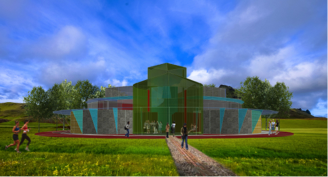 A purpose built sustainable building is in the development stage, read how Pamela and Lynsey’s vision may be able to help you in the future. A healthy mind is helped by a healthy body, with gift vouchers available look at gifting a series of gym sessions keeping the body well and the mind too. From UK Spa Association we would like to take this opportunity to say thank for being part of this inspiring developing industry. A successful and effective PR and marketing strategy are built through a consistent on-brand message, so by making sure you’re on point throughout the year, the shoulder months of January & February should look after themselves. However, some PR hacks which could be implemented during these months include . . .
Pamela and Lynsey are passionate about creating a complete lifestyle experience which will enable you to relax, reset, and improve clarity thus allowing you to continue your life’s adventures in a more balanced way. With combined experience stretching over twenty years in the wellness sector, their intent is clear: your well-being is their passion. It’s time to start thinking about the January gym rush, it’s the busiest month for gym sign-ups and expect to see a lot of your existing members back in the gym working off their Christmas dinners! Many gyms focus on sales during this busy period and neglect the retention of their current members. Rather than spend time looking for new members it is far easier and more cost effective to retain the ones you already have, it’s also far more enjoyable! With 75% of the UK gift vouchers sold during November and December, the market dominates this time of year. Simply holding out and hoping your customers will buy locally over the counter is likely to result in a mediocre result, but the UK Spa Association does not recommend dropping prices this time of the year. We must learn from the retail sector, who are now fighting back against the disastrous ‘pre-Christmas sales’ that occurred a few years ago. Stay strong on your prices, the consumer will pay if the service is good. The end of 2017 marks the end of a very positive year for our industry; revenues should be up, profit should be up, and Christmas should be positive for your bottom line. To all our members, on behalf of the UK Spa Association and the Board members devoted to making things happen, I wish you a very productive festive season and a watchful New Year. Investment in training and development need to be on all our Christmas lists, and quarter one 2018 is the time to make this happen. If you miss this, you will be running the risk of staff turnover at a time of year you will least want it; the run into Easter. My biggest thanks go to the Board members of UKSA, who for 2017 have created and built some stronger and stronger foundations for 2018, and we all look forward to the challenges ahead. If you are not a member, ask yourself why not, and let us know! This year we started promoting National Spa Week early on to ensure we got as many Spa’s as possible involved. From May onwards we had a regular presence via editorial and press advertisements and digital banners in many of the major trade titles including Professional Beauty, The Beauty Guild, European Spa, Spa Life, World Spa and Wellness and many more. 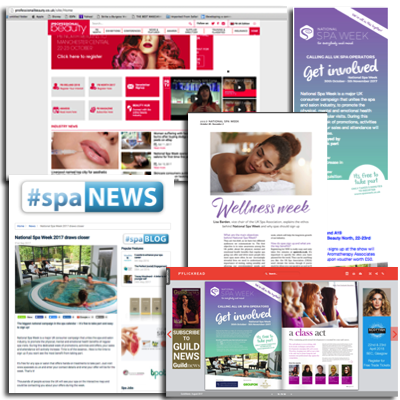 The National Spa Week Website www.spaweek.co.uk saw circa 3,000 unique users during the week and 480 spas registered to run promotions for the week – that’s an increase of 50% on 2016.